The Cricut Birthday Bash cartridge is chock full of fun images that are applicable to more than birthdays. This is a card for a young couple that recently became parents for the first time with the birth of their daughter Cadence Marie. I wanted something vibrant and fun to suit their positive outlook. I think the fun kangaroo and baby on Birthday Bash suited this task perfectly. However, it’s not just the cartridge cut that makes the card – it is also the paper, pattern, colors, and layers. I used Lori Whitlock’s “This and That” (6×6 paper pad) from Echo Park for the patterned papers. The rose was purchased (gasp, it came in kit from Taylored Expressions Key Ingredients). I used my Spellbinders Oval and Beaded Oval to make the frame behind the kangaroo mom, rounded the corners of the patterned background paper with my Corner Chomper, and added pink and red baker’s twine for the balloon string. This is a simple and fun little card – it measures 5 inches square and is an easel card. On the card front, the multi-color background paper was cut at 4.75 inches and the background Lagoon measures 5 inches square. I used a Signo Uni-ball white pen to add the “stitching”. To make the easel base, I used one sheet of 8.5 x 11 card stock and cut it at 5 inches wide along the length of the paper. Cut the 5 x 11 strip into a 5 x 10 strip. Score at 5 inches and again at 2.5 inches. Using a bone folder, fold at the score lines. Next, fold your card base in half at the 5 inch score mark so that it is a square (fold line at the top of the square as you look at it and the 2.5 inch score line visible). Add sticky tape to the bottom 2.5 inch section of the card base and place the card front directly on top of the base (matching side, bottom, and top edges). In order for the card to stand, make a sentiment that measures about 3 x 5 inches. I used white card stock at 2 by 4 inches for the printed sentiment, added a border of 2.5 x 4.5 inches (with the corners rounded), and a Lagoon base of 3 x 5 inches. Attach to the interior of the card base with pop dots. 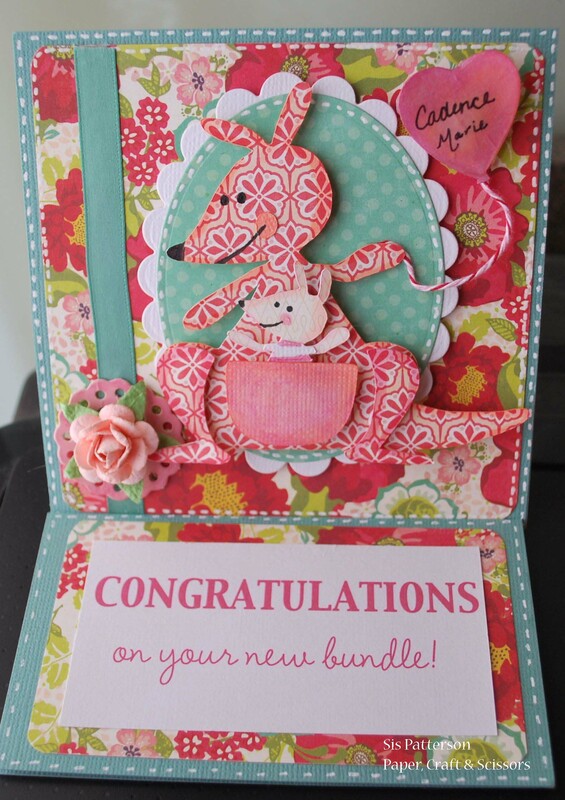 And voila, a fun and outgoing baby card – now to find a little gift with reds, pinks, and blue greens. I hope I can find something but I am sure to have fun looking…. This is adorable! I love all the animals on that cartridge. But, you’re right that patterned paper really makes this. Thank you for all the wonderful cutting and how-to details! This is a lovely card and all those patterns work like a little symphony! (Of course, you always pick perfect patterns!) I know the new parents will just LOVE this custom creation! I love the sweet rose accent! When Piper was born, we were happily surprised we had a baby girl. (We wanted the baby’s gender to be a fun secret.) Everyone started giving me pink roses as soon as they found out we had a girl. To this day, pink roses cheerfully announce “it’s a girl!” in my mind as they were so perfectly girly in our neutral nursery. Bless your heart for all of the detailed instructions! I just slap some paper on a cricut mat and hope it all comes out good enough to put on a card! LOL! I don’t write anything down and rely on my rusty brain to retain the thought for a few minutes. 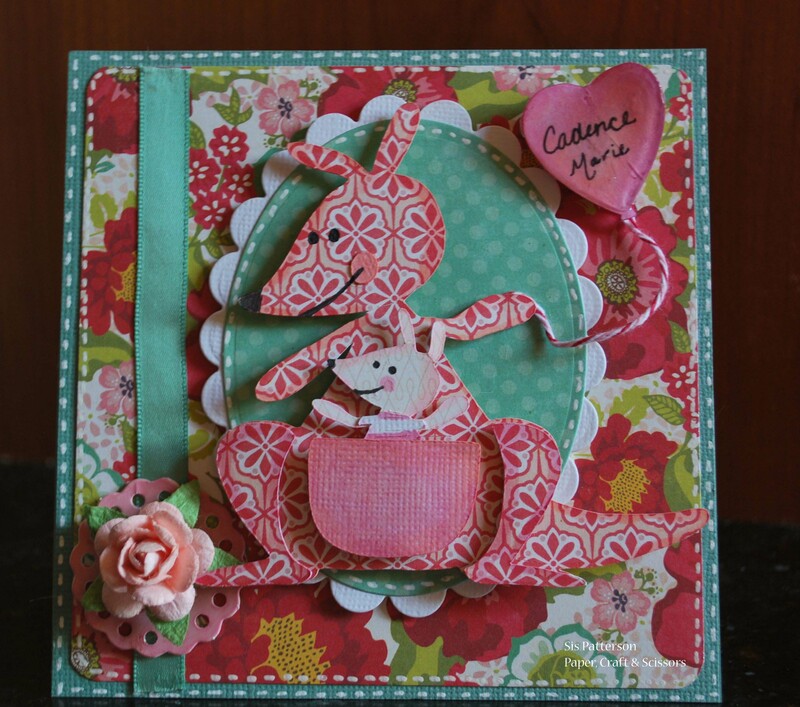 I am just loving your fabulously creative use of paper…makes the card all the more fun! You created a beautiful card. Really impressed with your color and paper texture choices. I am a follower and I love how you create cards with so much thought for the person who will receive them. You are a talented card designer and artist. I am so behind in visiting you! I love this adorable card. Makes me smile inside. I have this paper collection. I love it. I used it for Tatiana’s birthday card. Now I will have to see if I have enough left to squeak out a cute, pink kangaroo. I don’t have anyone to make it for, but she makes me so happy, I would keep her on my desk. Too adorable.